As the drag weekend approached fast, the topic of gearshifting increasingly dominated all our discussions. as mentioned earlier, no longer did we worry about the gearbox - instead, all our attention went to the clutch. of course, we got rid of the stiffer springs, now the idea was simple - what more mods can be done to the clutch? the more we thought about it, one simple rule seemed to emerge. if you look at the clutch setting "spectrum", there are two extremes to it - one, where the clutch slips like mad. and two, where the gears dont shift. very simple - when the clutch is ever-ready to slip, the gearbox hardly feels the engine. and on the other hand, when the clutch is bolted up ultra-tight, the engine is perpetually "sitting" on the gearbox, and the gearshifting becomes increasingly difficult. following this logic, we reached a simple conclusion - we need to move a little more towards clutch slippage. 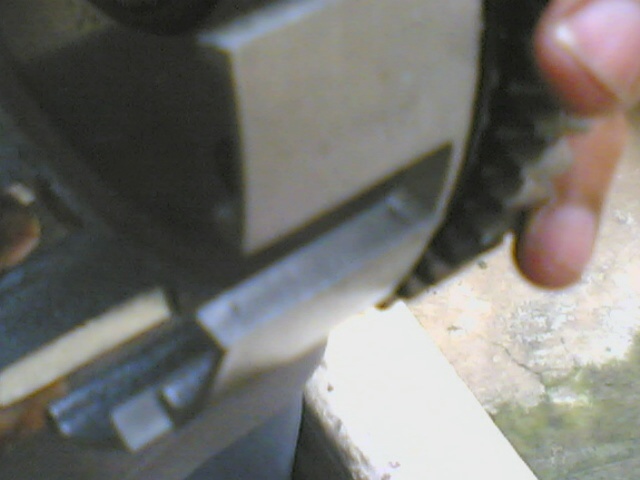 one solution obviously was to tweak the clutch screw setting and get to that point where the clutch "just does not" slip. but that seemed risky, too dicey, too much on the edge. we needed something else, some other mod. while that line of investigation continued, Jaggu came with a suggestion. why dont we take out the clutch basket and file the edges. what, what for, and how does it work? explanation followed, basically grooves appear on the clutch basket, where the clutch plate "arms" can get trapped and prevent them from moving apart easily. Ok cool, let us do it then. the next one hour passed in a flurry of hecting filing. it was not that difficult a job, but required a lot of patience. filing the aluminium is easy enough - but you have to file all the slots, and both sides. anyway me and Jaggu took turns, and soon cleaned up the whole thing. the downside of this mod is a tolerance degrade. the clutch plates sit looser, and jaggu informs that we might hear some clutch chatter at low rpms. but guess we will have to live with it. also, obviously the basket is good enough for only one or two rounds of this sort, after which, the tolerance error becomes unacceptable. so soon we finish our filing marathon, and now take a look. much better, isnt it. soon we gather up everything and it is time for a cleaning session. each part is meticulously cleaned and checked. all in all, a 2 hour job. finally, the cleaning done, we arrange everything on sheets of paper, and it is time to put everything back. 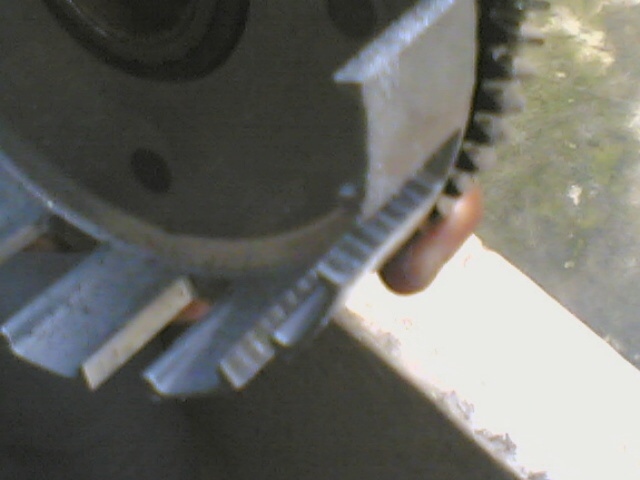 note that the clutch plates are rather old, kinda burnt even. we had a new set with us, but had not yet decided whether to move to them or not. reason is simple - new plates stick tougher, and gear shifting, if anything, will only get harder. so we take everything down and assemble them back. this time, we time the activity. it took slightly less than 15 minutes to assemble the clutch back. so we calculated that, given an emergency situation requiring a clutch plate change, it would take 30 minutes. soon it is testing time. these were probably our most careful, as well as detailed, testing sessions. we did three rounds of testing - one, with old clutch plates. 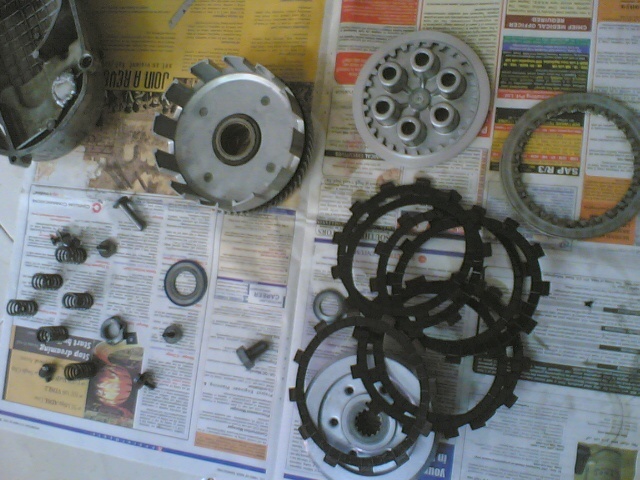 two, with new clutch plates. three, with new clutch plates and the rubber O rings mentioned in the Haynes manual. result stood out clearly - the old clutch plates helped most with gear shifting. round three was the worst, and we threw away those rubber O rings in disgust. we spent more time poring over the Hayne's manual, and this brought along more ideas.